Mid-Summer means the Friedrichshafen Rally in Germany near the Swiss/Austrian borders. It’s not the easiest place to get to from near Edinburgh and over the last 28 years I’ve driven in cars and camped, driven in motorhomes and camped, been on a coach and flown. It’s 30+ hrs drive from here so flying means you don’t need to waste 3 days traveling. For the last few years I’ve been flying Basel on the Swiss/French border and hiring a car. Basel puts you into a convenient place for French, German or Swiss summits. My other easy flight is to Munich but there are few summits there. I wanted a good length of time at the rally considering the cost/effort needed so I decided I’d wrap some extra holiday onto the trip. It turned out easiest to spend time before and after in France and having seen some pictures of the Vosges mountains, they selected themselves. On top of that, Victor GI4ONL gave me 2 sets of 7 summits which are feasible to be done in a day if you have the weather and don’t hang about. Do them all and you’d get 140pts with the longest being a 35min walk. I had a slight issue with my hire car that delayed me 20mins and in the end downgraded to a car best described as “La petite voiture du Noddy” a Renault Twingo III. It didn’t really accelerate and I had to shout “Allez! Allez! Allez!” to Big Ears who was in the back somewhere peddling furiously. Well it seemed that way. In the end I can tell you I became quite attached to Noddy’s car because it could do 135km/h when pushed, got me up and down mountains. In fact it achieved 51mpg and I drove everywhere with my right foot planted to the floor. Best was the roadholding… you should have seen the surprise on a BMW 3 series driver’s face when I overtook him (going down a hill) on a hairpin bend with all four tyres squealing away like banshees. Funnier still he couldn’t catch me till we dropped out of the winding hill descent into the Munster Valley where there are long straight roads. I stopped off at a small supermarket in Cernay for supplies for the next few days, a baguette and some cheese for lunch, nuts, fruit and 8L of Volvic water. From there it was into the hills and onto the first summit. Many hire cars cost more if you want the GPS. I spent some time un-bricking an old Nexus 7 Android tablet. It now runs a custom Android 7.1 image (wont work on the Play Store) but it runs OruxMaps. With it’s built in GPS and a 7in screen, it was ideal for navigating the roads and back lanes. The battery is huge and it was down to 55% left after 2 days of continuous use. Well worth a morning swearing at a PC and the re-flashing instructions. I flew past the turning for this and had to turn back. You can drive to an Auberge with a big car park. Here I was able to change from ordinary clothes to shorts and walking T-Shirt. I had to unpack a lot of radio gear from my checked luggage to my back pack and it took 25mins to get ready. I still forgot some stuff! The walk is easy on good tracks and path from the Auberge to the summit and takes about 15-20mins. Not difficult but this is where you spot the difference to Scotland, after 20mins walk in the heat, I was hot and sweaty. Set up was done using the wall to support a 5m travel pole and I used my Buddistick clone on 30/20m. I did have a verticlal antenna with me, designed by GM3VLB that he has used on many hundreds of activations of islands which has an adjustable centre loading coil. I had checked in the garden and it tuned up easily onto 30 and 40m. I was going to fall back to 40m on this antenna if conditions were poor on 30/20. It’s fascinating operating away from where I normally activate as normally I am far enough away from a lot of European chasers that 30 or 20 is always viable. But now in NE France I am amongst some of the chasers. On the air the first problem was no phone signal. I sat on the wall looking at the phone mast across on the next hill. But, always prepared, I had my satellite spotter with me. Well it was in the car still packed damn! I just needed to leave my phone for 10mins to decide to roam to a new network before spotting service was possible. Spot away and I worked 5 on 30m and 4 on 20m. Conditions were poor so I was unhappy with such a low count but happy to have activated. I called CQ for a while before deciding to move to the next summit. Back to the car took 10-15mins. First of many activated, the small cairn in the wall is the top. Premium quality ‘pole-in-the-wall’ setup. I had to dismantle the wall to retrieve the bottom bung of the pole. Then rebuild the wall. Camera was on some semi-manual mode hence the dark picture. Victor GI4ONL had provided me with the list of easy summits that were along the road I was taking to Gerardmer where I was spending the next few days. Next up was the highest Vosges summit. There is a large ATC RADAR up here and excellent paths to walk to it from the car parks at the col. Again only 15-20mins if that to get to the top from the car park. There was lots of building work taking place at the RADAR site so I went to the other slightly lower summit. I did check with the GPS that the col between summits was in the AZ, so both summits are in the AZ. Talking of GPS, I have OruxMaps and the maps / format files for my phone. With the built in GPS it does work well. However, the battery on my phone is starting to get a little short of life and for a reason I haven’t found, this phone wont control my satellite spotter. The fix is to bring my old Android phone which has a brilliant battery, runs the same mapping software and does control the spotter. You could ask why I don’t use the old phone again having also reflashed the Android image on that, well it’s much slower and has less memory. So it’s pressed into service as a GPS for foreign parts. At the summit, there were serious amounts of thunder crashes and static on the air. I tied the pole to an fence post but the fence wire was missing. Again my phone was lazy in roaming but finally I could spot and was away. Of course the satellite spotter was still in the car. Again a small haul, 4 on 30m and 3 on 20m. But it was around 1700 midweek so that was OK I suppose. I would have like to be chased silly so lots of people could get the chase but it wasn’t to be. Back down to the car and I wandered to the cafe and bought an ice cream. It was probably 22C and the ice cream was nice and refreshing. I was tired, I was up at 5.30 to get to the airport, then the stress of getting technical stuff on the plane, then getting a car, then adjusting to driving back to front and the heat. I would pass the parking for more summits and I would check them out compared with the Google images whilst getting to the hotel for a shower and a beer. Looking North East. There was a gentle breeze and it was pleasantly warm. Great countryside. Storkenkopf FL/VO-78 is visible from Le Grand Ballon de Guebwiller and is 5mins in the car to the next car park. I pulled over and thought, do I bag this now or make for the hotel? The hotel won and hey, there’s reason to come this way again to bag this summit! It took about 45mins I think to get to Gerardmer from here. My hotel was pretty from the outside with its own car park. Inside I was checked-in in a few minutes and up to my room which looked to have been recently refurbished. Nice view, a zillion channels on the TV, mainly French of course, a few in German, and BBC World. Wifi worked and was plenty fast. A load of batteries on charge for tomorrow and I was recharged in the shower. You have to admire French TV news channels. How can we get a good audience ? Get a young lady of stunning and amazing beauty to read the news. My French is awful so I didn’t know what she was saying but who cares. I sat transfixed watching. A very nice town, especially after getting something to eat and many local beers. It was probably 10mins from my hotel to the centre of a number of restaurants and bars. But damn, beer is not cheap in France compared with Germany or Czech Republic. Nice though. I was back at the hotel for 10pm when the rains started. For 4 hours we had torrential rain and stunning thunder and lightening. Oh dear, everywhere will be damp tomorrow. i could have made an earlier dart to bag more summits. But breakfast is an important meal being diabetic. So it was a injection and leisurely breakfast of meats, cheese and delicious fresh bread and rolls and a few gallons of coffee before I set of for a full day of summits. I set up and again no signal for spotting. Hahahahahaha! I have the satellite spotter with me now. Noooooooooooo! I had forgotten the power cable. After a few mins I had a weak signal and could get a spot out. Hard work to get contacts so early in the day but 6 on 30m and 2 and 20m did the job. Again as I wanted to do 4 or 5 summits there just wasn’t time to hang about. So I ripped the station down and set off for the car. As I was about 10mins outside of Gerardmer, I went back to the hotel and got the satellite power cable. Already looking slightly less pale after just an afternoon in the sun. Antenna lashed to a fallen tree trunk. Despite being very wet underfoot, the bird song and insect noises made this a lovely place to operate. No view to speak off though. Having collected the satellite spotter’s power lead, I had another check to make sure I had all the gear then set off back along the Route de le Cretes to Le Hohneck. This is a true, drive to the top summit. La petite voiture laboured up the steep road to the cafe at the top when I got to the queue. Someone on a Honda Gold Wing had failed to make the 120deg bend on the steep slope and had dropped the bike. A team of people were helping him up. Blockage cleared I parked at the top and was almost in tears at the sight of so many classic cars in the car park. I’ve always had a soft spot for classic cars and have owned 3 myself, an original 1963 Mini Estate, a 1966 Vanden Plas Princess R (with the 4L Rolls Royce engine) and a 1969 Rover P5B Saloon (3.5L Buick engine). The UK Fraser-Nash owners club were on a jolly as were a group of Swiss motorists with their classic (and immaculate condition) cars. A fine display of pre and post WWII Fraser-Nash BMWs. (There’s an Italian masterpiece on the end!) There were about 20 Fraser-Nash cars altogether. But what really made me cry was seeing a 1960-1962 Maserati 3500GT in immaculate but original and un-restored condition. I’ve only ever seen these in pictures. This had a body by Touring and was built with Superleggera construction. 3.5L straight 6 with 1 carb per cylinder. If this one has a decent ownership history then it’s probably worth around 325000 to 375000Eu. Maseratis have always been special to me. I saved up, over a long period of time, enough to by a modern pre-owned Maserati GT …then my son needed a house so the Maserati fund was spent helping him buy a house. Happy son, less happy dad. Anyway, SOTA. It’s 5 minutes from the car park to a good operating area. Up went the antenna, satellite spotter worked and I was in business. It was really hot now and I could really feel the heat in the sun, no static crashes so it was easy to rattle off a quick 12 QSOs, 3 on 30m and 9 on 20m. A French couple came over and asked what was happening. With their English and my French we could just about make sense. After a period of calling CQ with no response it was time to move on. System taken down and an ice-cream bought and I spent a few minutes with a Fraser-Nash owner talking about the Maserati as he thought it was a bit special too. I was surprised to see these snow patches remaining with it being well in the 20s. I saw quite a few more during my travels. I could understand it if we were 2000m up or more. A view off the end of summit. Lots of lovely deep valleys in The Vosges. Le Grand Ballon de Guebwiller FL/VO-001 in the far distance. I’m fairly sure the distant hill is Feldberg DM/BW-001 across the Rhine valley. It was back down to the main road and on to the next summit. This is about 15-20mins along the road from Le Hohneck. By now it was blisteringly hot for use from 56N, just an ordinary day to the locals. As I parked the Swiss classics drove past with the 3500GT in the lead with the most glorious exhaust tone. Followed by a 1971 Volvo 145 Estate (mint) and a 50’s open top US car. It was round and bulbous so I’d say 1955 or earlier. There’s a good path to the summit and you actually break in to a sweat as there is some climbing to do. 20mins to the top though. There were plenty of walkers so I setup just off the topmost part of the summit. By now I’d done 4 summits so the details become hazy. I spotted and activated again on 30 and 20m. I’m sure I put a number of SSB spots up but I could not attract any attention using just 5W. So I did tend to concentrate on CW as that was bringing in contacts. Sorry if you really wanted SSB but 5W, bottom of the sunspot cycle, mid-Summer, afternoon just doesn’t cut it with any certainty. 3QSOs on 30m and 7 on 20m. I think I had a few short skip QSOs to the UK, I think M0BKV down in Cornwall / Dorset featured. As soon as I had called CQ for 5mins with no reply I packed up and set off. If I was doing a single activation I’d call till the battery was dead. But when you are in a raid you have to move on when there are no more immediate chasers. Le Grand Ballon de Guebwiller FL/VO-001 in the distance. You can see the cafe buildings at the left hand end of the ridge and so you can see the walk and climb needed for the points. Another persistent snow patch at 1300m. The homebrew satellite spotter. Left box is the Iridium satellite modem, other box is a Raspberry Pi B+ acting as a modem control and Wifi Acccess Point. The Intel thing is a USB battery pack rewired to give 12V not 5V. Don’t plug your phone into this!!! Just so you can check you are on the right summit. A proper cairn. Bonus points to whoever built this. Just down the road from the parking place, repairs to a cell site were ongoing. This makes working on a tower easy. Holy Moly. That is a real cherry picker…want one! I decided to make my way back towards Gerardmer for the next summits as the distant sky was getting very dark. This summit is the site of a ski tow and is just outside Gerardmer. Even with a GPS it was hard work navigating through some road works in Gerardmer. After a struggle finding roads that were open I was able to drive up the side of the hill. There is an Auberge at the end of the road and the base of the ski tows but its car park was full so I parked about 200m back down the road near Restaurant Le Serotine. The sky was an ominous grey and I was sure I was going to get soaked so, obviously, I left the rain coat in the car. Well I had a small umbrella. There is meant to be a path to the top but I couldn’t find it instead I climbed the hill underneath the ski tows. It seemed to take forever to reach the top but this was just worry about the WX. It was oppressively humid and warm, not very nice at all. It’s around 500m of walk and 82m of ascent to the top. This was going to be a quick activation, I wanted out before the rain. I was up and away with a high speed setup (well I had had some practice in the last 2 days). The WX static noise and crashes was terrible, constant s8 on the 817’s meter. It was a real struggle to work 4 contacts and as soon as I had the 4 I was away. At least I didn’t leave a pile of chasers calling for me. Gear down as fast as possible and a few quick photos and I was away. I did find the path back on the descent. Back to the car and down to the hotel for a most wanted shower and beer. The view from the viewpoint. I operated from just off the left hand side of the picture. You can see the ski tows I walked by and the Auberge in the trees at the bottom of the final slope. Nasty clouds the bottoms of which were rotating and full of movement… time to go! Thanks very much for these activation reports. I am planning on holidaying in Alsace with my XYL in July 2019 and they are definitely wetting my appetite. I was last in the region some 4 decades ago, mainly Colmar and its surrounding area. It will be interesting to see how much has changed in all that time. My SOTA activation score is pretty low - so it looks like I could easily double it by spending some time in the FL/VO region :-). This was a day of relocation and I was planning on doing at least 1 summit on my drive from Gerardmer to Friedrichshafen. I’ve been this way before and it’s quite slow at times. D415 Gerardmer to Colmar to the border then B31 to A5 to Freiburg. Then the quite slow B31 through Freiburg and along through the Black Forest until you can pick up the Autobahns out to Stockach and then Friedrichshafen. A simple activation along the way breaks up the drive. 2 years back I knocked off Shauinsland and Kandel whilst traveling the B31. This year’s target was Hochfirst DM/BW-015. No problems finding the route to the summit, there’s a cafe and a big tower supporting phone antennas and dishes. I don’t like parking in these cafe’s car parks without buying something so I wandered in and bought a coffee as it was a few hours since I’d drunk a gallon or so at breakfast. Enjoying my coffee I saw the first raindrop fall. No surprise the clouds were black and low over the summit. What followed was 45mins banging and crashing and torrential rain. I was stuck in the cafe as my coat and umbrella were back in the car. once the rain subsided I ran for the car and continued. Well the forecast was for lots of rain today. Back down the hill and onto the destination. The B31 was quite quick for once. The Autobahns were even quicker. Finally I left for the B31n into Frierichshafen. Soon I was in stop-start traffic for 45mins till I reached the police car direct traffic off the road into Uberlingen. Haha! GPS power I’ll nip through the back streets and pick up the next junction. Wrong! The roads were bicycle or access only. Back up through grid locked Uberlingen streets to the B31n where I asked the traffic cop if he spoke English. Of course he did… he gave me perfect directions (in English) which I followed and were perfect. Got to love German efficiency. All in all it took 2hrs from first stopping in the traffic to getting back on the B31n. A quick check in and I located a friend not seen for 2 years were we then retired to the local cheap bar to await the arrival of the rest of my mates fly via Stuttgart. Some considerable beer and vodkas later, having all met up, we all retired for the night. The rally reports are elsewhere. Lots of SOTA people. Thanks to Jurg HB9BIN and the HB9SOTA people for another good session at the rally. At the rally, Jurg put me onto a nicely made trapped end fed antenna for 40/30/20m. Now normally I wouldn’t buy a ready made antenna like this, I’d make my own. But…I was in Prague last Autumn and had this bag of Czech Crowns left over. I always have a bag if Euros at home topped up when the rate is good and the Crowns were in the same bag when I packed for the trip. The guy selling the antennas was from Czech Republic so I was happy to use the Crowns as I’ve already paid the exchange rate fees. It cost 600Kr which is £20.50.I tried the antenna when back in France. This summit is a short way from the B31 just after leaving the A81 Autobahn. There is a large comms tower and so an easy road to the top. I’m not sure if where I parked was in the AZ or not but I thought 10mins walk along an almost flat track was in the spirit of things. I was tempted to try the new antenna but in the end thought I’d just knock this one off and if there were issues, try the new antenna on 40m. I setup on the edge of a lovely meadow well in the AZ. The true summit is in dense woodland and was a few metres higher than I was. It was too hot to go crashing through trees and there would only be many more flies in the woods. I managed 5 QSOs on 30m and 6 on 20m using the satellite spotter though phone coverage was excellent. Antenna setup on the edge of the meadow and another track. The summit has a huge flat top, true summit in the trees in the distance. Lovely wild flowers in the meadow. Bird song and insect noises were fabulous. The big comms tower. Despite my new camera having gyros and alignment marks I took the picture on the slant. I had to tweak it in GIMP as it offended me with the tower not vertical. 10mins back to the car then onto to give Hochfirst another bash. Andy: don’t worry, the tower on Schächer is never vertical, hi! I wasn’t going to be beaten this time and the WX was really quite nice. Back up to the top, park up, grab bag, buy ice cream wander about looking for a place to set up. Round the side of the tower behind the children’s play area looked best. I got the gear up in no time, I’d had lots of practice by now! Conditions were improving since earlier never mind it was a Sunday with more people playing radio with 8 on 30m and 6 on 20m. I called for quite a while for no more takers. So it was strip down system and set off for Colmar in France where I was staying for 2 more nights. Antenna behind the big tower. The tower with mobile phone panel antennas, dishes and assorted VHF Yagis and L band shrouded Yagis. For a few Eu you can get the key and go up to the top for a view. But it was a bit murky so the money staid in my pocket. This was some kind of WR42 waveguide adapter from a box with an Ericsson label. From here a run of flexible WR42 sized waveguide ran to the dish. A long, long length. Here’s the wee dish being fed with a HUGE run a flexible waveguide… the loss must be enormous. I can’t believe the loss in such a length would be acceptable. Why generate power on these frequencies where it is expensive (22-38GHz) to allow it to be wasted in the feeder system. There must be a length of sold guide with 2 flexible couplings. Didn’t look like that. Here’s the wee dish being fed with a HUGE run a flexible waveguide… the loss must be enormous. I can’t believe the loss in such a length would be acceptable. Why generate power on these frequencies where it is expensive (22-38GHz) to allow it to be wasted in the feeder system. Ah, but you are not allowing for the magical influence of the duct tape! This summit is about 10km from Colmar and I could see good parking at Collet du Linge on Google Earth. What I didn’t know was why there was such a big car park there. On the way I met a team of workers trimming the branches from the fir trees that were over hanging the minor road. At first I thought I would have to turn around as the road was green with branches and needles but some poor French from me and better English from a worker meant it was OK “mais doucement”. I drove very slowly through the brash thinking “how much was the excess on this car” and “don’t get a puncture”. Soon I was at Collet du Ligne and then it all became a lot clearer. 1975-1978 I did history at school, the subject being “Europe 1870-1939 from the unification of Germany to the origins of WW II”. OK I knew from this Alsace-Lorraine went from French hands to German in 1870 and back to France in 1918. I was in the middle of one of the big WWI battle grounds. La Ligne cost 17000 lives in 3 months, small compared with Ypres or Somme but plenty big enough. There is a memorial museum here filled with artifacts recovered from the fighting. The trenches went around the summit and many are still here. Original WW1 barbed wire and traps. I looked at this for about 5mins just contemplating what I was looking at and wondering how many men had fallen trying to cross it. They still recover the odd unknown soldier’s body when working in the fields and woods around here. And, they get a full burial with honours. The crosses mark some of the graves of those discovered a long time after the fighting stopped. This was a German observation place. I hoped you were issued with ear plugs as bullets hitting would make it ring like a bell. You can see bullet pock marks on it. I didn’t have time to visit the museum but it looked fascinating. I did nip inside (with permission) to use the toilets. (Damn my new diabetic pills! ) Something to visit when next in the area. It will be saddening but essential. OK, the path to summit starts opposite and takes about 10-15mins to reach the top. The first thing I found whilst scouting somewhere to operate was this WW1 trench. Looking at pictures from 1915, all the trees had gone from artillery actions. This high point would be a great observation point. SOTA time. I set up and noticed no phone signal but the sat spotter said plenty of signal to work. The RSSI indication goes from 0 (no comms) to 5 (no problem) and it was saying 3. I know this means that it can only see a few satellites rather than lots but it should work. Out went the spot and, as Rolls Royce would say, there was a failure to proceed. The status said message sent but “An error occurred during transmission”. Well yes, it meant that not enough satellite was visible for the few seconds of exchange. This is the first send error I’ve had. Iridium units do not work when this is their view of the sky! I started calling and worked nobody but eventually I got a poor signal on the phone and could spot. Plenty of QSOs after that on 30 and 20m. This was good activation and signals were nice and lively. It was still fresh in the forest and not too many flies. The car park was busy but no other walkers were about. A few calls on each band going unanswered meant it was time to go. Back down at the car park it was much hotter and coach full of kids (age 11 or so) was unloading so the tranquilty of the area was lost. Antenna in the trees. Sometimes the trees absorb all the signal, today they didn’t. As I headed off along the lovely quite rural roads towards the next summit I arrived at the Col du Wettstein and as I turned I saw something that stopped me in my tracks. I pulled over at the same time as some workmen arrived to work on the grounds. I sat on the bench and just looked at the number of crosses. I think I sat for about 10mins listening to the birdsong and all the noise of the breeze in the trees and occasionally, a car on the road behind me. Two young guys in hi-vis jackets started weeding. This is a French cemetery for some of the 10000 French soldiers kill in the La Ligne conflict. 3500 are buried here. 102 years after most of these men were killed, their graves were immaculate and still being maintained. Just as they should be. I’m not embarrassed to say that I didn’t have dry eyes as I walked back to the car. Andy, I think your personal 10 minutes say more about peace than what persons of the public life tell us about it. Thanks – would have enjoyed to give you a second “Like” on your thoughts. We took the other parking lot in May, at Baerenstall, where the German cemetery is located. 12 m more of difference in altitude from there than at your starting point, but we probably sat just aside the same hole. APRS2SOTA did it at Schratzmännele, but I was a bit late, so I struggled some time to get my 4 QSOs. 3 more summit reports and some closing comments and I’m done! Seriously, I’m glad that you had such a great time in (the vicinity of) FH and on your way home. Thanks for your interesting and inspiring reports. 20 minutes or so from Col du Wettstein you come to Gazon du Faing. There was a very busy Auberge and car park and I was just able to squeeze the car into the end of the parking. Another easy walk, less than 1km and 90m of ascent but it was very hot now so I ambled up. The ground reminded of Scotland with heather etc. Just it’s never this hot in Scotland. A very Scottish like summit. It was even a bit muddy in places after the recent rains. I continued up to the top and walking a few steps of the path found a genuine trig point. I set up here using the trapped EFHW for 40/30/20 as an inverted V with the ends support about 1m above the ground. I made a set of universal cables a while back, a 2m BNC male to male and a 2m BNC female to SMA+SMAfemale to BNC male. With these I can cross connect any and all of my UHF/VHF and HF antennas to either the 817 (BNC) or handhelds (SMA), worth its weight in gold. The commercial antenna has an SMA female. The SWR was just showing 1 blob on all 3 bands. Spot away and I tried 40m for the 1st time and was rewarded with QSOs. At this point I heard a non-English voice shout “who is doing Morse?”. It was Sake PA0SKP with friends who had come to activate the summit. During the rest of the day I played dodge the activator with him and Luc ON7DQ. I was happy to leave the summit to Sake as soon as I had qualified, he’d worked others who I didn’t and let me move on to the next summit which Sake had just activated. He said “oh, it’s easy, you can drive to with 500m of the comms tower and that is in the AZ.” So as soon as I had 5 QSOs on 40m and a quick lull in callers I packed up as Sake was setting up. I didn’t realise he was only QRV on 40m or I’d have done 20m myself. PA0SKP with big 40m/10m antenna and KX3 completing his activation. I thought I had a picture of us together but obviously not. I said goodbye and sped off down. The Auberge was still mad busy so I forsake an ice cream and made for the 2nd to last summit. 30mins later I was consulting the GPS to find the road to the top. It may have been OK to drive up it but it soon changed from Tarmac to rough loose stone with some biggish holes. It was steep enough that the poor old Twingo needed to take it in 1st gear so I had enough oomph to get up and not go so fast to bottom the car with its limited suspension. Anyway at the top there were 4 other cars and the poor old Twingo’s electric fan screamed for a good 5mins cooling its little engine. As Sake said, 500m to the top. Boy was it hot in the sun. you can just see the red wire and traps for the antenna is this photo. I spotted for 40m and worked nobody. 30 and 20 worked OK giving 5 QSOs on 30m and 9 on 20m. But the static crashes were building and most of the time I had S7 crashing and banging. The sky did its trick of going dark and grey and I thought I must, must be able to squeeze 1 more activation in before it starts raining. 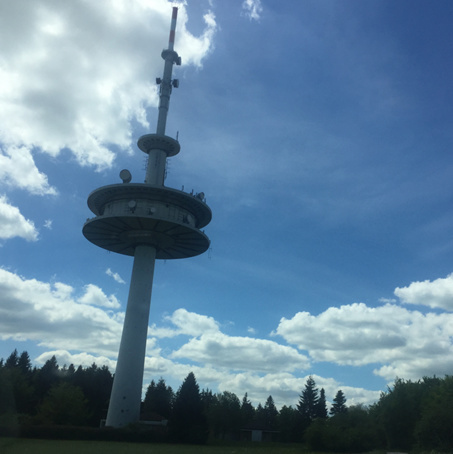 The comms tower, the reason for the road. No noise on HF from this which was good. The far sky is now dark and the heavy grey clouds are building locally. Rain and thunder due soon I think. I consulted my Orux map view of the “easy” summits for people based in Gerardmer/Colmar area and saw VO-089 was a short distance from a driveable point. In fact careful study showed I could get probably about 1km away before having to walk. I was able to get closer before I came to a sign stopping unauthorised access. When I got out of the car at the start of the woods I was mobbed by flies… thousands of them and the followed me nearly to the top. The true summit is in the woods so I was looking for somewhere that was in the AZ but on the track and with enough space for the antenna. This is where I decided I was suitably legit. The sky was black now and there were rumbles in the distance. I spent a few moments thinking was it safe to set up and decided to have a go. Any static / sparks when connecting up the antenna would mean I would abort. However, apart from S9 crashes everything went up without problem. I was on QSO number 3 on 20m when there was a huge flash and a bang. Ooo-err! I called CQ and was met with a wall of chasers, I worked one more when there was another huge bang. And that was it. End. Sorry for the smash-and-grab but there was no way I was staying on. I dropped the antenna, unplug it, no sparks and packed up in record time. Not the way to end the chain of activations but lightening is no fun when you are near one end of the big sparks. Interesting fungus growing on a cut stump. The boot is Euro size 44 for scale. Back to the car in 10mins and back to the hotel. The smash and grab nature was really not how I wanted to end the activations but such is summer activating in hot weather in the mountains. There speaks a devotee of the GM/SS region. My forever favourite bit of Scotland is Glencoe, a world of difference, lots more rock than mud, but anything from Crianlarich to Cape Wrath will suit me! I was listening to you on some of your activations when the QRN and electronic smog permitted - one day I’ll buy a key and give you a shock! Take your radio! I spoke to another GM SOTA activator who seemed to think there were too many easy summits. Partly due to the ski activities, there are roads that go up high in the mountains and these make some summits easy. You don’t have to start at the top, there a hundreds of km of trails so you can make these as hard as you want. The geography just falls nicely, there’s low scoring summits around Nancy and a small pocket of mid scores up near the German border at Saarland. Then there’s the Vosges themselves. So you can rush about and go on a points bonanza or simply enjoy the lovely countryside. Take your pick. For me not wanting to change flights if possible and starting from Edinburgh, Basel is a great destination for me. Near enough to drive to Friedrichshafen yet I could got France, Germany or Switzerland for summits. I’d never spent any time in this area apart from a quick activation near Belfort with Geoff G6MZX 2yrs ago. It’s a lovely part of the world. The food was good, the beer was outstanding and everyone I met in France made me feel welcome as a tourist. I just wish the radio conditions had been better so I could have worked more people and had some SSB contacts. I used an original FT817 at 5W into a Buddistick clone for 10 activations and the EFHW for 40/30/20 (from hamshop.cz) for 2 activations. Maybe a better antenna would have enabled some SSB activations but Sake PA0SKP said that even his KX3 with 10-15W he would be struggling in the doldrums of propagation we are having. Having designed and implement a spotter to use Iridium satellites a few years back, I was determined to use it here. It worked flawlessly apart from when it had an obscured view of the sky. What you’d expect for something on 1.5GHZ with an antenna 20mm X 20mm! It doesn’t work when you leave it in the car either! My phone eventually worked on the summits. The issue being that as it was roaming it has preferred foreign networks and it took some time to roam to a non-preferred network. Patience, something I lack, was all that was needed. After many years of suffering iffy-Wifi in hotels I bought a USB 3G dongle. This again roams like a champ and 30days / 1GB credit was £10 which is not a lot. My phone does not allow tethering when abroad and a contract that does would cost a lot more each month. The PAYG dongle solves the issue. It meant that I could continue to be online anywhere. In fact I added Phil G4OBK’s mobile number to the SMS database whilst we sat drinking beer at the rally. I looked for this location on the map and found that I drove right past it. But again it explained why there was some parked cars at a road junction. Had I spotted it, I’d have stopped for a moments reflection there as well as Wettstein. Again, it looks a tranquil place from the photos, especially the way the trees grow among the headstones. I think I missed it due to the dark colouring of the crosses. Easy or not, I’m sold on visiting here many more times.